When Jonathan Strahan asks you to write a story, you write him a story. So that’s what I did. 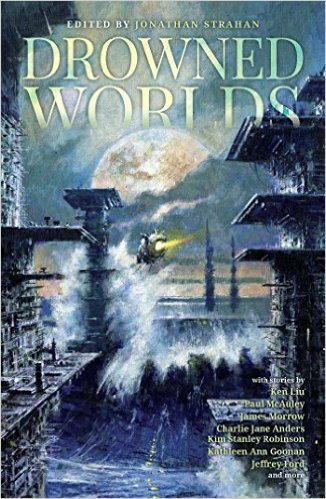 The theme of his new anthology (Drowned Worlds) was pretty broad, and it mapped right onto something I’d been pondering for a while. (All my Twinmaker stories this year are ones I’ve given a lot of thought to. Anyone would think I was getting slow in my dotage or something.) Out-of-control fabbers deep in the clouds of Venus . . . the mighty Tash on another life-logged adventure . . . the possibility of life on Venus . . . It all came together in ways that I found surprising and exciting, usually sign that something’s working. “The New Venusians” is set in the same universe as the Twinmaker series, but I think of it as an alternate-timeline story, one in which Tash destroys a world rather than Clair. It seems fair to spread the guilt around. In this world, maybe people wake up to the dangers of mass-teleportation and put some checks and balances in place. Or maybe Wallace and Kingdon are encouraged to act more boldly. Who knows? “One hour!” The complete unreasonableness of this demand momentarily overwhelmed the crazy nature of what they were doing to me. No counselor this time. No talking therapy. No lectures, which frankly I would’ve preferred, even the ones I’d heard dozens of times before. Just sixty minutes to pack everything I might want to take to another planet? When I look out the grimy yellow porthole, all I see is cloud. Don’t forget: “Lust, Entrapment and the Matter Transmitter” in In Your Face. Up next: “The Lives of Riley” in Lightspeed.